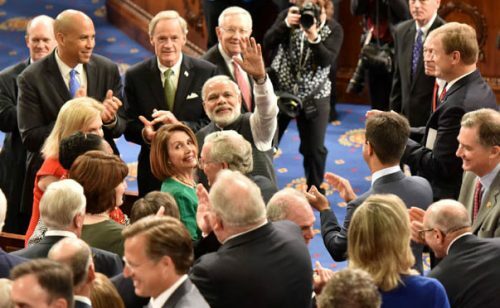 The Prime Minister, Shri Narendra Modi meeting the US Congress members, before his address to the Joint Session, at Capitol Hill, in Washington DC, USA on June 08, 2016. प्रधान मंत्री नरेंद्र मोदी जी को गुजरात दंगो के नाम पर कुछ राजनेतिक में सक्रीय लोगो ने देश और विदेशो में भी बदनाम किया . यहाँ तक की अमेरिका ने नरेंद्र मोदी के अमेरिका के प्रवेश पर भी पाबन्दी लगा दी थी और तो और हमारे देश के 65 सांसदों ने ओबामा को चिट्ठी लिखकर मोदी जी को अमेरिका ना बुलाने की अपील की थी. इतनी कठिनाई और विरोध के बावजूद मोदी जी डिगे नहीं अपना कार्य करते रहे और आज ना केवल अमेरिका ने मोदी की हस्ती को माना बल्कि आज मोदी जी ने इतिहास रच डाला ये हर भारतवासी के लिए गर्व की बात तो है ही और इस बात का संकेत भी की भारत का विश्व में दबदबा बढ़ रहा है. और इतना ही नहीं मोदी जी के प्रयासों से भारत उन 34 देशो में शामिल हो पाया जिनके पास MTCR (मिसाइल टेक्नालॉजी कण्ट्रोल रिजिन्)है.अब भारत विश्व को अपने द्वारा बनाई गई भारत में निर्मित मिसाइल को बेच सकेगा इन देशो के साथ मिसाइल तकनीकी का आदान प्रदान भी कर सकेगा. The beginning of degradation of Nepal started from the nefarious conspirator role of Congress (I) and its Intelligence Agency RAW. On 22 November, 2005, the 12-point agreement was reached under the direction of Congress (I) Govt. and its Indian intelligence wing RAW against the 1990 constitution to format the new constitution from Constituent Assembly(CA) to terrorize Nepal. Since that day, Hinduism and Nepal’s nationality and democracy have been endangered. India imposed the secularism, republic and federalism. The agendas of secularism, republic and federalism embedded in the 12-point understanding are not the agendas of political parties. In fact, Nepal and India are only the two pious Hindu countries in the world. But, Congress (I) and its RAW had designed to end the identified symbols of Nepal-the world Hindu kingdom and Hindu monarchy in Nepal. Luckily, Congress (I) Sonia Gandhi’s regime ended-2014 and the Hindu nationalist party-BJP arose in India with big majority. It is very hopeful that the BJP party and Modi Govt. will consider to end the conspirator nefarious design of Congress (I) and RAW which had imposed evils of secularism, republic and ethnic-based federalism in Nepal. Last year India has witnessed the historical victory of nationalist patriotic power as a democratic practice of world’s largest democracy. We heartily congratulate Prime minister Sri Narendra Modi, a visionary leader. We believe Indo-Nepal relations will find new dimensions with new government of India respecting the Hindu kingdom and Hindu monarchy in Nepal.. But we always seek positive support and developmental cooperation. At this time, we are in crisis. All Nepali people want India be supportive in reinstating our lost pride-Hinduism and constitutional monarch. The Nepalese monarch always has goodwill with India. The fact is that the Nepalese monarchs held special right for carrying out ritualistic worship in many Hindu shrines and temples in India. Then, India’s Hindutwa also can be dignified. Then, the strong Hindu nationalist leader Narendra Modi- PM of India should have to suggest to the Nepalese three party leaders-Maoist, Congress and UML to keep intact the world Hindu kingdom and Hindu monarchy in Nepal who have been guided to impose secularism, republic and federalism by the hints of EU, Christian Mission, CIA and former Congress (I)’s agendas. Hinduism educated us global brotherhood, humanitarian and respectful coexistence among differences. I strongly believe that Hindu philosophy can guide the entire world for humanitarian values and norms. As honorable Indian Prime minister Narendra Modi recently said our principle that Basudaiva Kutumbakam…..is the only option to make inter-countries’ relationship more harmonious and meaningful. Obviously, it will contribute to reorganize this world better place to live for our forthcoming generations. But the basic question is if we don’t recognize ourselves, nobody will recognize us. Hinduism is our identity, Hinduism is our dignity, Hinduism is our life. It is the pride that we are part of it. The essences of Nepalese nationalism are- Hinduism and monarchy. These are typical identifying symbols of Nepal. Nepalese royal institution basically was known for national unity and patriotism. Nepal’s sovereignty, integrity and national pride addressed by Hindu monarchy. The Hindu monarchy has especial privilege in India to devotee the temples and Dhams in Biswonath in Kashi-Banarash, Tirupati, Somnath, Amarnath, Rameshoram, Kamaru-Kamachxya. Nepal has three great qualities-1) Pious land of Rishis, sages, originated the Vedic, Hindu sculptures and shrine books. 2) Ancient sovereign-country ruled by Hindu monarchy and 3) Birth place of Lord Buddha and Hindu kingdom in all over the world. In this sense the Indian Hindus and the Hindus of whole world should have to conscious to save and dignified the world Hindu kingdom and Hindu monarchy in Nepal. Nepal always seeks a permanent, loyal and respected permanent institution–the monarchy. The reality is that the strategic and geo-socio-political situation of Nepal mandatorily demands the existence of monarchical institution in the country. The monarchy and Hindu Kingdom both are inter-related identified symbols of Nepal. Our concern is national stability, unity and complete democracy to maintain the balance relation with India and China. Since 2006, Nepalese Hindus are suffering from the Maoist, Congress and UML’s nefarious activities. The three party leaders have been joined their hands with EU, Christian Missions and CIA to impose Christianity in Nepal and to break China in the name of free-Tibet. This is because our basic foundations are violated; consequently national unity and sustainable peace has not been achieved. The constitution is non-functional with the annulment of the constitution of 1990 that was suddenly suspended without any reason. The country has been unconstitutionally declared so called republic, secular state and ethnic-based federalism. This is in fact, foremost cause of the deteriorative situation of the country. Now, we are facing the most terrible crisis. Probably we are experiencing the darkest period of our entire history. Nepal has been standing on the verge of disintegration for the last 10 years. And neither the law nor decisions is working in Nepal. Due to the eccentric corrupt characters of the party leaders, the parliamentary system has not come to right path as well as the country’s development programmed can move. The parties are choosing the ethnic lines to operate themselves to break Nepalese unity. This is tantamount to opting for a suicidal path. Due to the anti-nationalist activities of the Nepali Congress, UML and Maoist leaders, Nepal’s condition has become very critical. Due to the RAW nefarious conspirator roles, anti-India slogans are increasing day by day. So, to maintain the harmonious and cordial relation between Nepal and India and to keep intact Nepal’s sovereignty, and Hindu Kingdom, there must be restored the unchangeable point of 1990 constitution. The concern of the Nepalese people is complete democracy. Hindu Kingdom and the constitutional monarchical democratic system is the identified symbols of Nepal. The Nepalese people don’t want any dictatorial system and foreigners’ intervention. Since 2006, we Nepalese people are suffering from the Maoist, Congress and Communist party (UML)’s regime who are guided by the RAW, CIA, EU and Christian Mission to fulfil their pretty interest. Since 2006, the constitution has stopped working. The foremost cause of the deteriorative situation of the country is the annulment of the constitution of 1990. What were pitfalls of the Constitution of 1990? It was suspended without reason by the hint of Congress (I) Govt. These are the causes of crisis of Nepal. Nepalese democratic exercise faced the black period in between 2005-2015. During the period, the Nepalese people tolerated the worst political practice made by corrupt leaders. However at the political level, Indian Congress (I) government has been trying to create nuisance in Nepal’s effort to strengthen its nationalism and democracy. Then, BJP leaders must understand that if Nepal due to any reason, is destroyed, India won’t get any peace. Forgetting Nepal’s background of Hinduism and Buddhism, a democratic country like India, should not work to create anarchy and establish terrorism in Nepal. But why are the United Nations, America and other foreign powers, despite knowing the identity and value of Nepal, are supporting the continuous ruin of this country? Hinduism is the mother of all religions. But we in Nepal are trying to dig up a well though there already is water in our rivers. ‘OM’ is a symbol of Vedic Knowledge. Hindus, Buddhist’s Mantra. It provides a fine example of Symbolism. Symbolism is needed in all fields of human knowledge like science, religion and politics. If we want to know the greatness of Hinduism, we can see The Great Wall of China, “the seventh wonders of the world” has a fourteen feet long Sanskrit incantation engraved on the western gate. Mongolian emperor Kublai Khan had written ‘OM Namo! Bhagawati’ including others in the 14th century. The Chinese Great Wall has many syllables from ‘Mahabharata’ written on the doors in Sanskrit language. It is not a common thing that the language was written in Kalipinya letters. We in Nepal are suffering from the madness notorious activities of Christians and its brokers to destroy the Hindu identity in this pious land. Senior leader of B.J.P Lalkrishna Advani had said: ‘The framework for constitutional monarchy in Nepal should be consolidated because monarchy is the symbol of Nepal’s identity and sovereignty. Nepal should have an active and dynamic multi-party democracy’. Present Home minister of the Govt. of India and the BJP leader Rajnath Singh said- ‘We used to feel proud that Nepal was the only Hindu kingdom in the world,’ Singh said. ‘I will be happy when Nepal is a Hindu state again. ‘We used to feel proud that Nepal was the only Hindu kingdom in the world. ‘I will be happy when Nepal is a Hindu state again. No one is appealing to the Islamic states of Pakistan and Bangladesh to become secular. But it was done in Nepal.’ – 2010-3-22, in Nepal. Foreign Relations Deparment Chiej of BJP Vijay Jolly said-‘ I am a Hindu who follows Hinduism. I am much upset as a decision on such an important topic was taken without taking people’s opinion’ July 4th 2014 Kathmandu. Actually, the real introduction of Christianity we should have to remember the expression by American former President Jefferson has said- ‘The Christian religion subjected many to inhumane torture in course of proselytizing them– many were imprisoned; many thrown into fire, and given mental torture. The Christian religion deceived and tricked half the population of the world to keep them in illusion. Other half were made naïve.’ Similarly, South African leader late Nelson Mandela has said- ‘In Africa, previously the Christians had the bible we possessed the land. Today we have the bible while Christians possess the land.’The Hindu Philosophy preaches that all the people of the world are our friends. Fraternity & honesty always has been propounded by Hindus because Hinduism is the foundation of human civilization. So, Hinduism is very challenging issues for Nepalese and Indian Hindus and BJP Govt. Then, to keep strengthen the universe, it is necessary to keep intact the constitutional monarchy and Hindu Kingdom in Nepal.